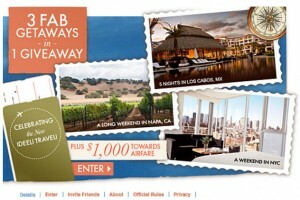 Enter to Win 3 Fab Getaways in 1 Giveaway from ideeli! With the exciting launch of ideeli travel, they are celebrating this great giveaway! For every friend who enters, you will receive an additional entry! Persons who “Like” the ideeli page, reside in the 50 United States and District of Columbia, and are at least 21 years of age can enter. Learning a ton from these neat atriecls.